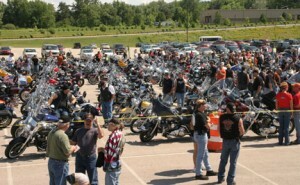 Thousands of motorcycle enthusiasts will ride the Great Lakes Seaway Trail byway to reach the â€œRoar on the Shoreâ€ July 15-17 in Erie, PA for a biker caravan through the city streets to Liberty Park, downtown, and other venues with music and food. This July 2010, driving the 518-mile Great Lakes Seaway Trail Americaâ€™s Byway that parallels the St. Lawrence Seaway and the Great Lakes of New York and Pennsylvania, takes you to events that include Americaâ€™s oldest continuously-running county fair, the largest garden tour in the U.S., the final New York State Signature Event for the 250th Anniversary Commemoration of the French and Indian War, the 50th International St. Lawrence Seaway Festival, and more exciting events and festivals. Find details for all the events listed below at www.seawaytrail.com/events. Eleven counties (10 in NY and one in PA) offer county fairs each year. The July 1-5, 2010 Oswego County Fair offers free admission and parking in Sandy Creek, NY. Americaâ€™s oldest continuously-running county fair is the 193rd Jefferson County Fair in Watertown, NY, July 12-18. Itâ€™s all about the kids at the July 26-31 Orleans County 4-H Fair in Knowlesville, NY. July 4th holiday celebrations along the Great Lakes Seaway Trail include Fair Haven, NYâ€™s Independence Day Festival July 2-4 with a boat parade, carnival and fireworks. Massena, NY, celebrates July 3-4 with a car show, block dance and blues bash, while 2,000 costumed French & Indian War interpreters will take â€œSiege of Fort Niagaraâ€ at Old Fort Niagara in Youngstown, NY, July 3-5. History also comes alive on the Great Lakes Seaway Trail with the final New York State Signature Event commemorating the 250 Anniversary of the French and Indian War. Several hundred British & French forces reenactors will recreate the last significant battle of the War, a Colonial trade fair, and a bateau race as part of the July 16-18 Founderâ€™s Day Weekend in Ogdensburg, NY on the St. Lawrence River. Hollywood actor Mark T. Valley may even be among the reenactors at Fort La Presentation! Break out your bustles, crinoline skirts, and leg of mutton-sleeved blouses for Fredonia, NYâ€™s July 16-17 Victorian Dazzle Festival with period costumes, ghost tours, lectures, antique vendors, and variety of Victorian-era arts & entertainment. â€œPresident Abraham Lincolnâ€ will attend Union-Confederate battle re-enactments at the July 24-25 Civil War Weekend in Massena, NY. British & American forces once again battle to control the Niagara frontier with day and Saturday night reenactments at the July 24-25 War of 1812 Encampment at Old Fort Niagara, Youngstown, NY. On Friday, July 30th at 6:30pm, visit the Great Lakes Seaway Trail Discovery Center in Sackets Harbor, NY, to hear decorated soldier and military historian US Army Colonel (Ret.) David Fitz-Enz share the stories of the heroes of the War of 1812. On Saturday, July 31st, the Colonel will sign copies of his books: â€œWhy a Soldier,â€ â€œThe Final Invasion,â€ â€œOld Ironsides,â€ and â€œRedcoatsâ€™ Revengeâ€ at the Center from 1 to 3 pm. The July 31-August 1 War of 1812 North American Grand Tactical at the Sackets Harbor Battlefield State Historic Site, just a few steps down the street toward Lake Ontario from the Great Lakes Seaway Trail Discovery Center, will have American & Crown forces demonstrating period camp life and cooking, music and dance, games and weaponry, and historic etiquette. Those who enjoy garden tours can drive â€œDown the Garden Pathâ€ in Knowlesville, NY, July 10 for a tour of flower, vegetable and herb gardens with Orleans County Cornell Cooperative Extension Master Gardeners. Call 585-798-4265×26 for tickets. Buffalo hosts the largest garden tour in the U.S. July 24-25. Follow a free self-guided walk to 341 urban, water, rock, cottage and vegetable gardens in historic neighborhoods. Every Tuesday evening in July, Erie, PAâ€™s Liberty Park Pepsi Amphitheater resounds with free live music: hear Rusted Root July 6, Key West Express July 13, Jakeâ€™s Blues July 20 and Abby Road July 27. The July 10-11, 2010, and 42nd French Festival in Cape Vincent, NY, features French pastries, parade, band competitions, block dance, 200+ crafters, and fireworks. That same weekend you can explore Rochester, NYâ€™s lovely Corn Hill historic district filled with more than 400 artists and entertainers at the Corn Hill Arts Festival or compete as amateur or pro angler teams fishing out of the Oswego & Mexico, NY, harbors in the Lake Ontario Pro-Am Salmon & Trout Team Tournament weekend. The Nazareth College Arts Center Dance Festival with parades, original free performances runs July 10-17 in Rochester, NY. Accordionist Paul Riley and the Mexico Brass Band perform before Young Explosivesâ€™ fireworks light up the night sky July 11 at Mexico Point Park, just off the Great Lakes Seaway Trail (NYS 104B) in Mexico, NY. Itâ€™s Italian Idol on the Great Lakes Seaway Trail. The singing competition is part of the July 15-18 Sorrento Cheese Buffalo Italian Heritage Festival in Buffalo, NY. Pultneyville Civic Light Opera will perform â€œThe Sorcererâ€ as part of Pultneyvilleâ€™s July 17-18 Homecoming. The 50th International Seaway Festival includes the areaâ€™s largest parade, a fishing derby and fireworks July 17-25 in Ogdensburg, NY. Gateway Harbor Park along the Erie Canal is the venue for nightly entertainment, crafts, adult and kiddie amusement rides and games, a parade, and fireworks for the July 18-25 Canal Fest of Tonawanda & North Tonawanda, NY. A 5-time American Bus Association â€œTop 100 Event in North America,â€ Harborfest in Oswego, NY, directly on the Great Lakes Seaway Trail, features world-class fireworks over Lake Ontario and free entertainment stages throughout the waterfront city July 22-25. If you are vacationing on the Great Lakes Seaway Trail, you can â€œDiscover Presque Isleâ€ with artists, childrenâ€™s games, beach volleyball, entertainment, and a bonfire July 23-25 at Presque Isle State Park near Erie, PA.
Itâ€™s time for Christmas in July, Wine Night, Military Day, and the Salmon Spectacular at Henderson Harbor, NYâ€™s July 23-August 1 Waterfront Festival. More than 125 entries are expected for the July 30-August 1 Antique Boat Show & Auction in Clayton, NY. Follow the Great Lakes Seaway Trail byway to reach this nautical marketplace with professional auction, entertainment, educational forum, dance, and Grand Parade of Boats at The Antique Boat Museum.